The Lady Kalani necklace features a beautiful Lightning Ridge Opal doublet with bright rainbow colours in a feathery pattern. This beautiful doublet is decorated with a handmade 925 silver flower and leaf motif within a silver frame. 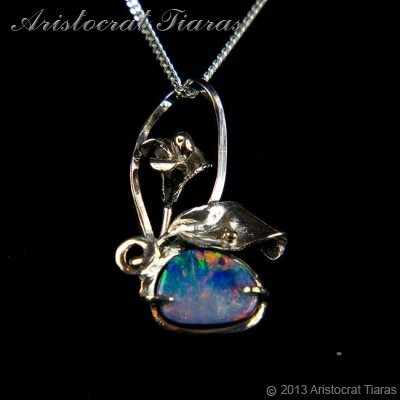 This attractive necklace from Aristocrat Tiaras is part of our Opal jewellery collection for one special mother of the bride or lady to enhance her outfit or makes a fantastic gift for any special occasion! Please note: This Lightning Ridge opal doublet is one off gemstone and is unique, the pendant shown is the actual item for sale and the gemstone can not be duplicated.